The dishwasher is an invention that revolutionized the way consumers wash dishes. Like many technological devices before it, the dishwasher removed the grunt work from daily activities. Before this product was invented, consumers were forced to wash dishes by hand, which could’ve taken up to half an hour to finish. Originally, all dishwashers were classified as built-in appliances, so they couldn’t be removed and used elsewhere. Portable dishwashers were created to close the gap and give consumers more convenience. Portable or countertop dishwashers can be operated on a countertop, so you have the option of storing them away when you’re finished. These products are designed to help you conserve energy and save money. A portable dishwasher is a great appliance to own because you can loan it to friends or family members. When shopping for these products, size is an important consideration to make. This product is also a great buy for students, as they can take their dishwasher with them when they move away to University or when they change accommodation. The size of these products is measured in place settings. A larger number means the dishwasher has a greater capacity. A place setting capacity of six is ideal for standard households. A smaller number is ideal for individuals who live alone. After deciding on a size, functionality is another important consideration. Some models have six different wash cycles while others have only three. For optimal convenience, make sure to choose a portable dishwasher that comes with a faucet adapter. Below, you’ll find reviews for the top 10 best portable dishwashers that you should consider when looking to purchase. The Danby DDW611WLED is a great product to start with. It’s an Energy Star appliance, so you don’t have to worry about it sapping electricity and causing your utility bill to skyrocket. With a six place-setting capacity, you can fit this dishwasher under most kitchen cabinets. You can quick connect it to virtually any kitchen tap, and it only uses 3.17 gallons of water during a regular cycle. Also, the Danby DDW611WLED features a convenient automated rinse and detergent agent dispenser. There are six different wash cycles to choose from and features a bright LED display. With an interior made of stainless steel, this dishwasher shouldn’t have much trouble matching your existing kitchen décor. It features a bright white color and helps you conserve energy while saving money. Overall, this appliance offers decent value for the money. When it comes to kitchen appliances, SPT is a well-known brand. 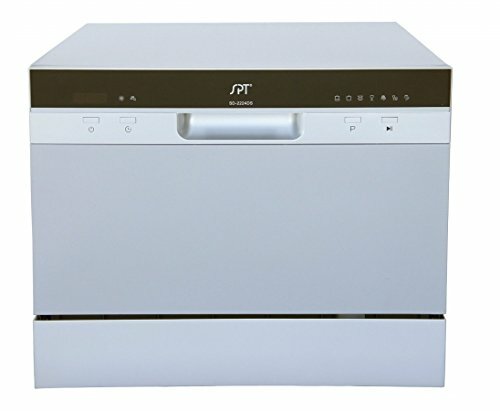 If you’re looking for a top portable dishwasher, consider the SPT Countertop Dishwasher. With an interior and spray arm made of stainless steel, this appliance looks good while resisting food particles. It features a silverware basket and dish rack, and since it has a six standard place-setting capacity, you can fit plenty of dishes inside of it. 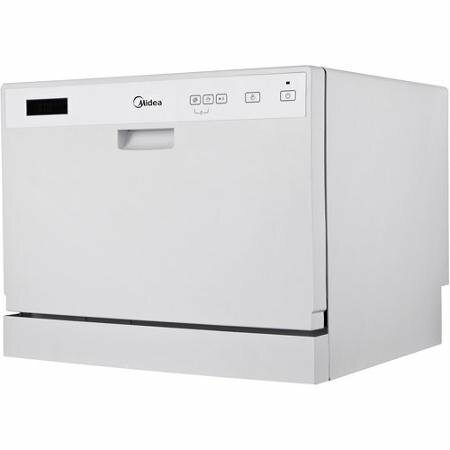 The user controls are friendly, and the SPT Countertop Dishwasher is equipped with an automatic detergent dispenser. For a quick and simple connection, it comes with a convenient faucet adapter.There are six different wash cycles to choose from, so you can choose the best cycle for the dishes you’re washing. This portable dishwasher is ideal for small kitchens, offices and apartments. 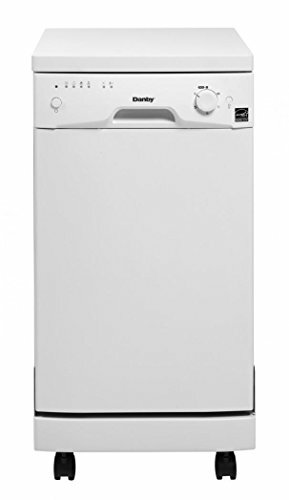 It features a beautiful, sleek design and delivers plenty of dishwashing power for the money. Another top product to consider is the SPT SD-9241SS. It offers a convenient time-delay feature, which can be set between 1 and 24 hours. You get six different wash programs to choose from. The light program is great for dishes that don’t need much cleaning while the heavy cycle is ideal for the dirtiest dishes. This particular model comes with an adjustable upper rack, so it can accommodate larger pots and plates. The faucet adapter that it comes with is very convenient and makes installation quick and easy. 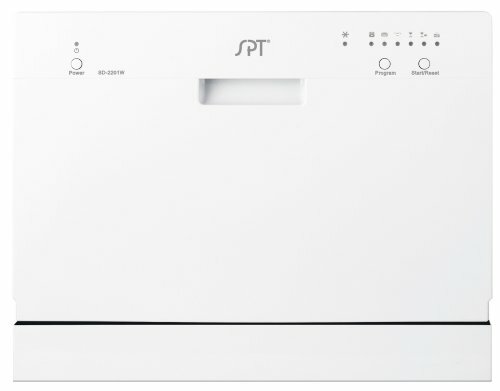 The SPT SD-9241SS has a spacious storage capacity, so it’s better for consumers who plan to wash many dishes at a time. The controls are easy to use, and the interior is made of durable stainless steel. It can handle a water temperature up to 154 degrees, so it has no trouble tackling the dirtiest plates. Since it uses a quick-connect adapter, this model doesn’t require permanent installation or plumbing. With such a large storage capacity and several features, the SPT SD-9241SS is ideal for situations that require serious dishwashing power. 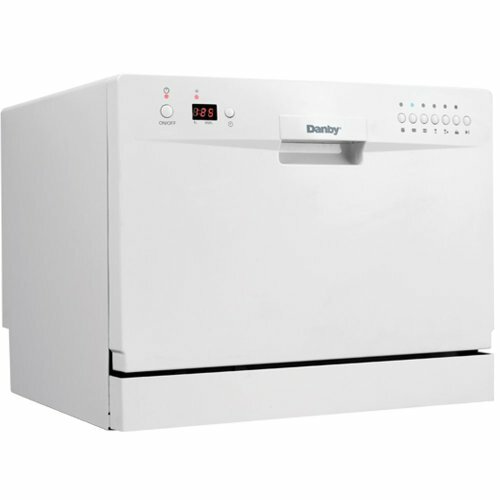 Another popular product from Danby is the Danby DDW1899WP-1 Portable Dishwasher. With an eight place setting capacity, this is one of the larger models available. It features a convenient silverware basket, so you can clean all of your spoons, forks and knives. The Danby DDW1899WP-1 is Energy Star compliant, which means it won’t cause your electricity bill to dramatically increase. To make operation easier, it features easy-to-use controls.The interior and spray arm are made of stainless steel, so they’re very good at resisting corrosion and food particles. A feature that sets this portable dishwasher apart from the rest is the built-in water softener system. The Danby DDW1899WP-1 is convenient and efficient, and it has the potential to make life easier in any home. 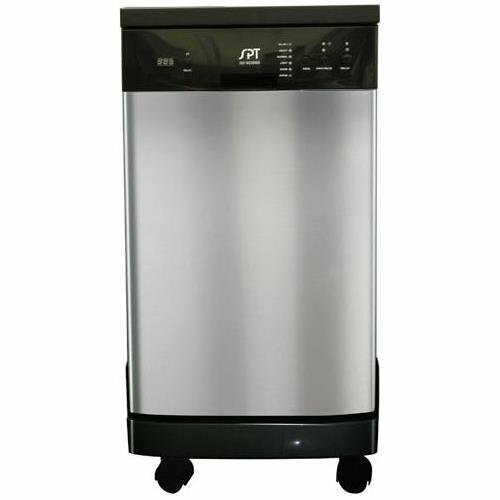 If your goal is to purchase a popular countertop model, consider the Koldfront 6 Place Setting Countertop Dishwasher. It has six different wash cycles, so you have many cleaning programs to choose from. Unlike many other models, this portable dishwasher includes a cutlery basket, cup shelf and dish rack. A standard six place setting capacity provides plenty of room for your dishes. The interior is made of stainless steel, and it can hold plates that are 10.5 inches in diameter. Depending on your needs, you can choose one of several different wash cycles. This particular model is available in white, but you can also select the black color.You can fit this dishwasher under most cabinets, and it doesn’t require permanent installation. If you’re looking for decent storage capacity and additional space to clean specialty items, the Koldfront PDW60EW could be exactly what you need. The EdgeStar DWP61ES features six standard place settings, so it has an average storage capacity. It has a compact, low-profile design, and you shouldn’t have any trouble fitting it on most countertops. Unlike a traditional dishwasher, this product doesn’t require permanent installation. Since it only uses about 200 kilowatt hours per year, it can save you a lot of money. Many other countertop dishwashers use as much as 60 percent more electricity. While this model is particularly energy efficient, it’s also great at saving water.A vibrant LED display makes this dishwasher very easy to operate, and you get six different wash cycles to choose from. The heavy cycle works exceptionally well for eliminating bacteria and germs because it can boost water temperature up to 149 degrees Fahrenheit. It even comes with a cutlery basket and cup shelf. With a grand total of seven wash cycles, the SPT SD-2224DS has more wash programs than most other portable dishwashers. For optimal convenience, it features a delayed start. You can delay the run time by two, four, six or eight hours. It comes with a universal faucet adapter and quick connect, so there is no need for permanent installation. The SPT SD-2224DS is easy to connect to most kitchen faucets. With an LED display and electronic controls, this model is very easy to use.It even has warning indicators for rinse aid and water supply. 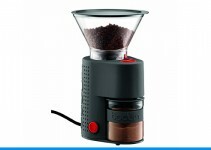 Like similar products from SPT, this model is ideal for office kitchens and apartments. It gives you full-size power in a compact package. The spacious cavity lets you wash many dishes at once. 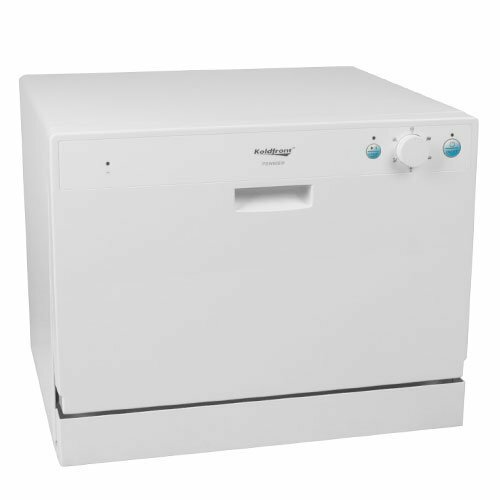 If you’re looking for a standard countertop dishwasher, this is a great choice. Here is a top product from Midea. 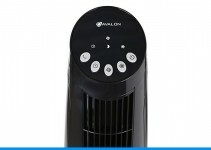 Its compact size makes it ideal for apartments and dormitories. However, it can be used wherever there is an open faucet. Some great features of this model are low water and energy consumption. If you need some additional dishwashing power during the holidays, this could be the perfect product. With a six place setting capacity, it has a standard storage capacity.It will fit under most kitchen cabinets and offers many of the same features as a full-size dishwasher. There are six different wash cycles to choose from, so you’ll have plenty of dishwashing power. If you’re looking for the best portable dishwasher, you can’t ignore the Magic Chef MCSCD6W3. It has a six place setting capacity, so it’s great for standard kitchens. It uses 680 watts of electricity to blast the food particles, germs and bacteria off of your dishes. The interior is made of stainless steel, and there are five different cleaning cycles to choose from. For optimal safety, the Magic Chef MCSCD6W3 features a floating switch anti-flood device.A detergent dispenser makes life easier by automatically dispensing detergent onto dirty dishes. 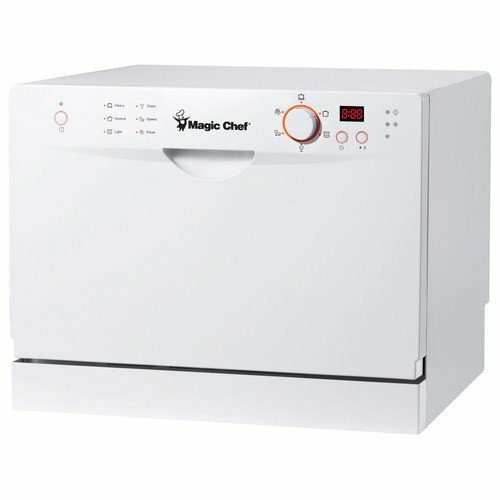 If you need a top portable dishwasher for your kitchen, the Magic Chef MCSCD6W3 is a great choice. Here is another excellent product from SPT. It offers seven different wash cycles, so there is a cycle for every situation that you might encounter. For your convenience, it has a mechanism for delayed start, which can be set for two, four, six or eight hours. A universal faucet adapter makes this portable dishwasher compatible with almost any kitchen faucet. 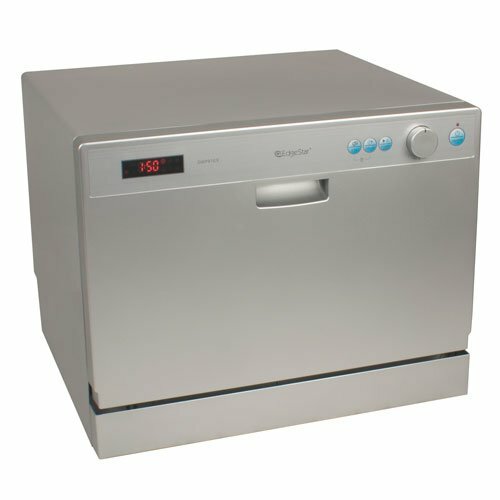 The SPT SD-2224DW is a great product to purchase for small-sized kitchens, office kitchens and apartments. Although it’s a small appliance, it delivers cleaning power comparable to a full-size dishwasher. If you’re looking for an affordable, efficient countertop dishwasher, this is a great product to consider.